Jesus charged his disciples, "Go ye into the entire world and preach the Gospel." Hence our witness to faith in Jesus Christ comes from those who precede us. As St. Philip’s Episcopal Church celebrates the first hundred years, we joyfully recognize some of our modern disciples who have communicated the Good News through word and deed. Erskine served St. Philip’s loyally as Junior Warden, delegate to Diocesan Convention and in reaching out to help others. Notably he helped organize, with St. Andrews Episcopal Church, a project to provide food for those in need. Erskine always wanted to help children and black people. He said, “I told them to take a chance.” Through giving from the heart, hard work, and encouragement Erskine Cooley made a lasting impression on many people. Erskine Cooley was baptized “down by the river” through the Baptist Church where he was raised. He came to St. Philip’s Episcopal Church by way of friendship with Vicar Brown. Erskine lived across from St. Philip’s when it was located on Logan Street. The Vicar commuted to Greenville from Spartanburg by train and arrived early in the morning. He and the Vicar met on his porch for conversation and his connection to the Episcopal Church became reignited. Mr. Cooley aspired to higher education. Heartened by recommendations from Phyllis Wheatly, and Mr. Huggins, he decided on Voorhees College. With $6 dollars in hand, Erskine journeyed by bus, arriving at 2:00 a.m., penniless. After meeting with the president of the college, he was immediately accepted to the work-study program. After working at the shipyard in Charleston and as Assistant to the Superintendent of Jenkins Orphan Home, he joined the Army at the outbreak of the Second World War. Erskine went to Tuskegee to be a pilot, but alas, his frame was too large to fit into a fighter plane. After the war he became the first African American licensed contractor in South Carolina and is well known as a mover of buildings. Betty Martin serves St. Philip’s with a joyful heart, expressed in decades of service to St. Philip’s: preparing the altar, cleaning, decorating for Christmas and whatever needs doing. Betty along with Annette Smith was active in the Diocesan Episcopal Church Women and visited many other Episcopal Churches. 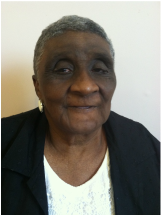 Betty Martin originally attended the Baptist Church near the home located on land that had been in her family for generations. The children had become dissatisfied with the long services and she decided to respond to the invitation to St. Philip’s by Mrs. Huggins. The entire family attended and St. Philip’s was immediately recognized as having the style of worship they appreciated. Betty’s legacy includes family members who continue the work of St. Philip’s. The Peace of God passes all understanding and when we pass the Peace at worship, we greet each other in that knowledge. This is a gift that St. Philip’s extends to each Brother and Sister. Mary Joyce Thompson has devoutly served as Treasurer of St. Philip’s for many years. She also maintains a major role in the Altar Guild and the Episcopal Church Women and has been a Delegate to Diocesan Convention. Mary Joyce was invited to attend St. Philip’s by Rachael Floyd who taught at the same school and with whom she rode from Nicholtown. She found spiritual inspiration through Fr. Sparks. The Reverend George H. Sparks, Jr. who was Vicar 1962 to 1967 inspired many by his selfless example and strict dedication to the church. Mary Joyce remembers entering the church building on a Saturday to find Vicar Sparks and his wife scrubbing the floor. She believed that members ought to be more responsible and began the tradition, along with Betty Martin, of taking care of the church. Preparing the altar and decorating for Christmas stand out as works of love. Mrs. Thompson recalls the profound involvement of St. Philip’s with the Diocese through her many times at Diocesan Convention. She mentioned that at the Great Gathering at the Palmetto Center in 2002, St. Philip’s achieved the highest attendance of any church (by percentage, a whopping 105%) and was awarded the Christian Fish Symbol Sculpture on display in the narthex. Jo Kerns was an active member of St. Philip’s, sang in the choir and played organ for the church. Involvement with the Diocesan Episcopal Church Women allowed opportunities to interact with the churches in South Carolina and the larger world of the Episcopal Church. Jo’s spiritual journey began at a young age at St. Mark’s Episcopal Church, Jackson, MS, where she was raised and confirmed in the Episcopal tradition. Jo Kerns arrived in South Carolina and searched for an Episcopal Church. It was Myrtha Green along with Mrs. Huggins who welcomed her to St. Philip’s. The friendly and person-oriented attitude of St. Philip’s made the decision to transfer her letter one she never questioned. She joined the mission at the same time as Annette Smith and Beth Eli. Jo inspired her husband and family to attend and is now recognized as the most senior regular attendee of the Church. Jo continues to worship at St. Philip’s, traveling with her son Thomas from Smyrna, Georgia. Although it is difficult to be in residence often, her presence is appreciated and felt when she is absent from her St. Philip’s family. Jo lovingly supports the continuing mission of the Church. John Shumate served St. Philip’s with a caring heart. During the tenure of Fr. Sparks, he joined our church family and was a committed member of St. Philip’s serving as Secretary to the Vestry and Junior Warden. It was Erskine Cooley who recruited “that young man” John Shumate to take over for him as Junior Warden. John was raised in the Baptist tradition and the Episcopal Church received a blessing from his presence. John greatly appreciated the worship and fellowship of St. Philip’s and stood tall and respectfully at worship. He continued to attend in spite of illness. John, recently deceased, sustained a strong presence at St. Philip’s throughout his life and provided outreach to many. He cared deeply for his wife and children and liked to help people. John Shumate will be remembered among the Saints of God from St. Philip’s. His presence is missed, but his spirit is still felt by those whose hearts he touched. God bless a good and faithful servant. Annette Smith was a lifelong Episcopalian, baptized at St. Cyprian’s Episcopal Church in Pensacola, FL. She arrived in Greenville in 1947 and attended a variety of churches before transferring to St. Philip’s. Annette faithfully served St. Philip’s over the years. Annette’s hands helped prepare and serve suppers for the church. Her recipes are known to be scrumptious and she still maintains the secret process of formulating the pancake batter, revealed only to a few. She accepted the responsibility of representing the Episcopal Church Women both at home and in the Diocese. She and Betty Martin toured numerous Episcopal churches attending meetings of Diocesan Episcopal Church Women. She offered wisdom and support to this group. As we celebrate our Centennial we recognize the support our church has received from “good and faithful servants.” Many of the needs of the church were fulfilled through the ingenuity of Annette and members such as the donation of chairs and dishes from the Poinsett Hotel. Annette recalled the highly successful Fashion Shows organized by Myrtha Green that generated funds and community participation. These acts are part of the fabric that makes St. Philip’s an inclusive family of members. Annette’s daughters are active in St. Philip’s and maintain the tradition of service. Annette also gifted the church with her commitment to mark the moments through photographs, articles and stories that preserve and celebrate our past. Many of her photos will be on display as part of the Centennial Celebration. Many other outstanding members were recounted during conversations with our long time parishioners. Numerous people came to St. Philip’s because they were invited and welcomed by outreaching members: Rachel Floyd, Myrtha Green, J. Huggins, and Cleo Dyches. Talented lay leaders provided direction and organization: Maceo Anderson – Treasurer and Senior Warden, Dr. E. A. E. Huggins – Senior Warden. 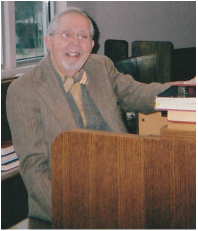 Church Organists: Luther Davis retired as organist in 2015. He was preceded by Jo Kerns, Mrs. E. A. E. Huggins, and Alfreda Downs. 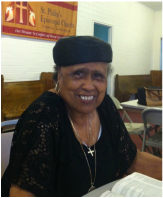 Betty Drayton was community leader as well as church leader.